Whether you're remodeling your office, moving, upsizing or downsizing, it means that you have to get rid of some items. Even though small clutter may take you most of the time to sort through, things such as cubicles, furniture, and workstations may be difficult to deal with. Whether you need junk removal following office renovations or you are clearing out clutter before an office relocation, you don't have to deal with all that junk on your own. Our South Bend Junk Removal professionals can help you with your cubicle removal to make work easier for you. When you are conducting a major office furniture removal, it may be difficult to determine the cubicles to keep and the ones to remove. Depending on how long the cubicles have been in your office, they may have become worn out. Or the cubicles may have become smaller for your increased workforce, and you want to remove the existing ones and install bigger ones. Either way, it may be convenient to have an expert on hand to assist with sorting cubicles into various categories, such as "trash," "donate," "recycle," and "keep". If you see that you will need help sorting items during an office furniture removal, contact us at South Bend Junk Removal to help you. Carrying a few bags of trash to the dumpster may be easy. However, heavy furniture is another story. Most office cubicles are constructed with various materials and designs. While there may be some lightweight ones, others may be built with much heavier materials. Our junk removal specialists know how to lift and carry heavy items without injuring themselves or damaging your property in the process. Also, any debris left in your office is best removed by a team of experts who know what they are doing. Even standard trash bags may be exhausting to move in bulk. Avoid cuts, bruises, splinters, nails, and strained muscles by entrusting the heavy lifting to our experts. Driving back and forth to get rid of your cubicles may be time-consuming and tiring. If you are wondering on what to do with old cubicles, our South Bend Junk Removal team can help you solve this problem. The crew will get the unwanted cubicles off your property. We are aware of local laws and codes affecting the disposal of specific items, which means that you won't have any problems in future. Plus, we do cubicle recycling as much as possible and we are also willing to donate office cubicles to help other people. We can also help you evaluate the cubicles and determine the ones that can be donated and the ones which are too worn or damaged to salvage. You don't have to do anything once the removal has started, South Bend Junk Removal will do all the dirty work. 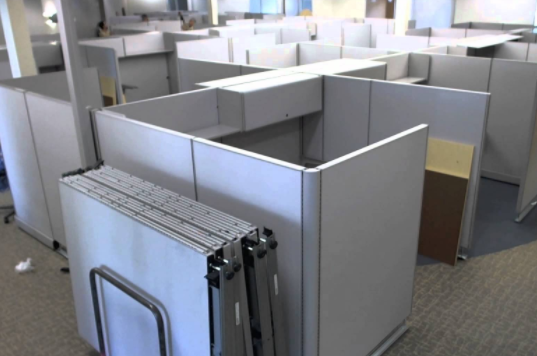 We have the expertise and knowledge required to conduct office cubicle removals professionally. This will make your removal less stress and worry-free. Schedule an office furniture pick up and enjoy our cubicle removal services.